As our family headed into downtown Cleveland for a weekend vacation, I sighed to myself. Here I was, going to the city where Michael Symon (probably best known for being an Iron Chef on the Food Network) has two restaurants, and I wouldn't get to dine at either one of them. The impetus for our trip was for one son to see his beloved Minnesota Twins play the Indians at Progressive Field, and for the other son to go to the Rock & Roll Hall of Fame. I reminded myself that our time with our sons was flying by, and trips were for having fun as a family. I'll be able to experience fine dining, I thought, once they were out of the house ... and through college, so that we could afford it ... and that was about 10 years from now. Sigh. 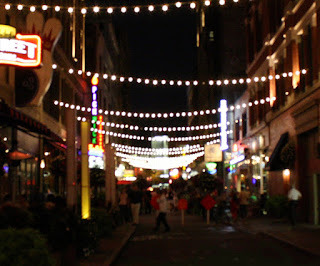 On Friday night, we checked into our hotel (the Holiday Inn Express on Euclid) and headed out on foot to find a place to eat. After a block or so, we spotted a bustling street strewn with twinkle lights, with lots of restaurants. We decided to check it out. The weather was perfect, in the 70s without much of a breeze, so we agreed that we wanted to eat outside in a restaurant that was fairly teen-friendly. We picked the House of Blues, which was one of the few outdoor areas where there wouldn't be a wait. (Word to the wise: you're not going to get the best meal by picking the least busy restaurant. We knew that, but we didn't want to deal with a long wait and frankly the ambiance of the street would make up for shortcomings with the food). Right after we ordered our beverages, a photographer came by to take our picture. I knew we'd be hit up for buying an expensive package of photos. Our fault for picking a tourist spot, I thought. One son ordered a turkey club, the other a burger, and my husband and I split a rack of ribs. (My husband and I don't usually share meals, but in this case the ribs only came in a full rack, and the waiter told us that people often split them). I also ordered what was billed as "Our Famous Rosemary Skillet Cornbread." While we were waiting for our food, we unsurprisingly got the sales pitch for our pictures and spent about 12 bucks on a couple of prints. We did some people watching and every so often spied the Goodyear blimp that was flying overhead (it was at the Indians game). As I looked at the signs down the street, my gaze settled on the sign that said "Lola." (Way at the bottom of this picture, in an oval.) Lola, Lola, Lola ... I was trying to think of why that name sounded so familiar to me. Then it hit me: that was Michael Symon's restaurant! And I was walking distance from it! My 14-year-old son and I decided to take a quick stroll down there. It looked slick and sophisticated. We were both wearing tie-die t-shirts, but we summoned the courage to go inside and ask to see a menu. 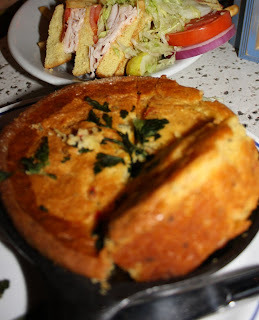 When I saw the menu, I thought our family could go for lunch because there were many items that were approachable -- club sandwich, pulled pork, a burger, and fried bologna (a favorite of my husband's). But the friendly hostess told me that they didn't serve lunch on weekends, so that was out. She did say she had a table for two available at 6 p.m. the next day. 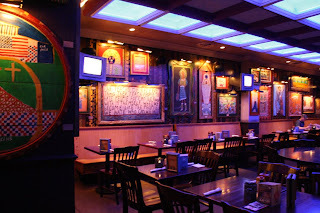 I told her I'd think about it, and as we walked back to our table at the House of Blues, my son and I agreed we'd love to get a chance to eat there. I told my husband about the 6 p.m. opening, but said I didn't want it to disrupt our weekend plans. After dinner, our waiter offered to show us the room where bands played (they curiously don't have entertainment on Friday nights). It was a cool space with lots of folk art on the walls, and the stage had an interesting patchwork curtain. My son remarked that he'd love for 441 (his band) to be able to play a gig there someday. I'm on the edge of my seat Tracy! Can't wait for the next post. Perhaps you will be as lucky as Lily and I were in New Orleans last October at Emeril's? Hope So! Sounds like so much fun Tracy! You really know how to build up the anticipation! Love ya! Can't wait to read part two. I am looking forward to reading more about your trip. Just found your blog - I'm a Rochester native and grew up what I'd guess is about 15 minutes from you if you shop at the Penfield Wegmans and are 10 minutes from Webster. : ) I've enjoyed the reminders of home - my parents still live there. This is wild to read someone's reaction to Cleveland through the eyes of a visitor. I live in Cleveland...and have most of my life. I love that tourists come to Cleveland. We have so many great places to visit. Please come back. Our city is changing a lot. The "neighborhoods" are fun to visit: Tremont, Little Italy, Larchmere, St. Clair-Superior, etc. My mother grew up in Tremont, so it's really fun to see what changes have been made over the years. I had computer troubles and didn't get to finish my recap of Cleveland, but I will! Mary's Mom, we loved Cleveland and will definitely be back! We are heading to Cleveland over Feb break for a Cavalier's game and some Rock and Roll. I'll watch for your next post to see what else we don't want to miss!